"DIGGING!!! I LOVE IT!! CAN'T STOP! Time to play Dig Dug"
"Oh, I LOVE this song," *singing along* "I am a dwarf and I'm digging a hole, diggy diggy hole, digging a hole!" 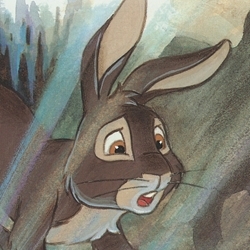 "You know, we rabbits from the Cowslip's warren are civilized." Strawberry: "Look here: We've got electricity from men"
Bigwig: "You mean, you steal it"
Strawberry: "No, we get it. And food. And safety!" Bigwig: "And what do you exactly do with that computer thing?" Strawberry: "We do things. Create shapes! Look here"
(Not a caption) Here I was thinking that the rats were the only ones that had electricity. Well... Maybe that whole Thorn Valley place is located near the Warren of Shining Wires. In that case rats could teach Cowslip and others how to harness the power of electricity. Cowslip: Our warren is the best place in the world since we invented the wireless technology. Cowslip: "Imagine: Using a wireless mouse"
Cowslip: "A mouse without a tail"
Hannah: "Ha ha! Very funny! I'm off. Ugh, rabbits!" Bigwig (entering the room): "What's with her again?" Hazel: "She's upset because of her tail"
Bigwig: "Maybe she should try wireless"
Strawberry: Screw those angry birds, I'm play Oregon Trail baby! What's diphtheria? (Wooh, seeing that old thing made me think of those old computer games back when screens were black and white and green).